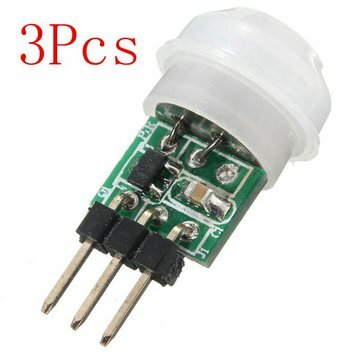 AM312 body sensors modules: a passive body based on the digital intelligent infrared technology, automatic control products. High sensitivity, high reliability. Widely used in various auto-sensing electrical equipment. - Immunity enhancement, internal use of digital signal processing, direct high-low output. - Repeatable trigger: the sensor output high after, the delay period, if there is human activity in its sensing range, the output will remain high until the people left after the delay, it becomes low (ie: sensor module detects the human body every activity will be automatically extended a period of time delay, and to the last activity time as the starting point of the delay time).